Isnt most of the difference usually because of taxes? I most countires that is found not to be the case.. Here about a third is Tax..
REDRX3RX8 was kind enough to share his UOA, take a look. Interesting. Did anyone post results of dino diesel 15w40 oil with 3k+ miles? I saw that OD posted his results which held the viscosities in range, but that was only with 1k miles. Also, is anyone running Mobil's synthetic diesel? What is the viscosity range, and is it a full "real" syn? No but all UOA's are welcome and appreciated. Mine has been sent, I should get it soon. What range viscosity do you want? Do you want the 7 to [email protected] 100C of 5w20 or the 15 to 16cst @ 100c of 20w50? 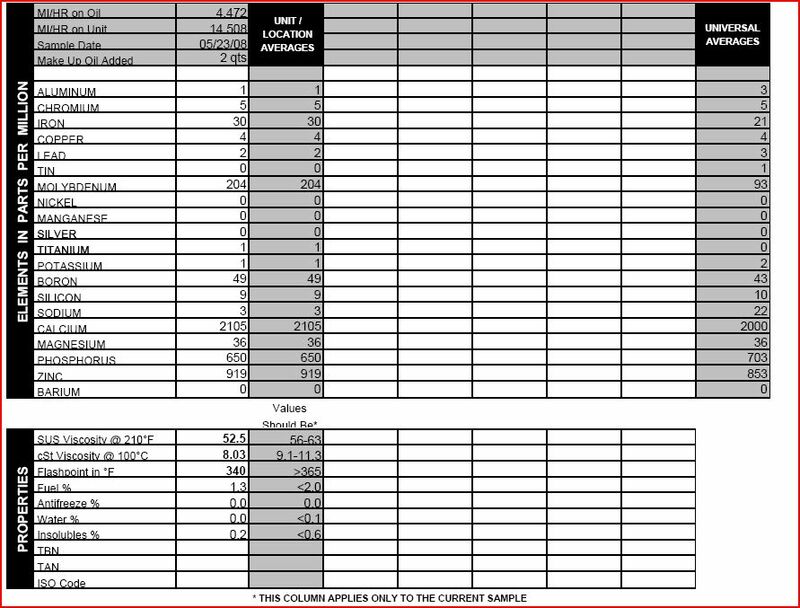 Yeah, Mobil 1 0w40 spec sheet says approx [email protected], but thats just candy and nuts, and the specs show way over a 10w30. My report still had a some 5w20 and the usual fuel dump even though I was real careful to heat up car before sampling. People that bring up (didn't stay in range) are have 40 year old info from Andy Granatelli selling STP viscosity improver. These new 0w oils get the weight from good chemistry buildup not just throwing in extra vi improver which can cause hard carbon. Your knee seems a little jerky. This isn't the first UOA that I've seen showing the Mobile1 0w-40 thins out to a high 30w oil from the 40w range. Sure the fuel dilution didn't help but overall this oil does seem to lose a bit of it's viscosity over time. Still, when we're talking about 1 to 2 cSt of viscosity loss that's really not a huge deal. Even less when you're looking at that loss occurring over 4,000 miles of use. As for Diesel oil...just remember that oil choice comes down to application. You can run just about anything off the shelf in your motor and you'll be ok but some stuff is simply a better fit for how you use the car. sorta like asking what car is best---well it depends. Use the uoa to develop your trend--dont take just a single reading. Take a look at my analysis I had done on 15W40 with 3k on it. It still was within range. There is a link to my post on the first page of this thread. Dang dude, I missed that post. Thanks!! Care to share your driving habits? Viscosity is low. Last edited by 9krpmrx8; 01-07-2010 at 10:10 PM. This uoa is from your 5w30 @ 14k, and with the usual excess fuel looks like 0w20. I saw your uoa on your Shell Rotella 15w40 diesel oil with 12.5 [email protected], and you have found your oil. I know a guy in West Texas with the usual Chevy pu with 350 v8 that is still running at around 1/2 million miles without any internal work using Rotella 15w40. You and olddragger are onto something because its over kill additives @ good price. I run 0w40 Mobil 1 because it tests about 12cst @ 100c to maybe stop that front stationary bearing wear, and it tested the most hp and torque of many heavy weight in a dyno test. Well, I'm still split between sticking with Rotella 15-40, and switching to Mobil1 0-40. But the good news is that they both sound solid for the Renesis. Maybe I'll run a 50/50 blend of the two. Hey RX8Convert22, you mind if the mods merge our two threads? I didn't realize you had started one and there is some great info there as well. Question: Shouldn't we be looking at wear metals in addition to viscosity, in order to get a better grip on the bearing wear issue? and that SHOULD be viscosity related. Wear metals were high in my GC 0W-30 and the were slightly higher in the 15W-40 vs. the Mobil1 0W-40 results posted by REDRX3RX8. I wish we could create some type of comparison chart for the renny. There are a lot of variables here. It will take a tremendous amount of data to prove meaningful correlations between viscosity & bearing wear via UOA. Case in point, if I'm not mistaken, one of the reports on this thread with the lowest Iron content is somebody running Castrol 5w20. I still think UOAs are good idea, and I'll post my results here soon. But, an enterprising person could start a spreadsheet and collect the data as it is entered, and over time we could, perhaps, begin to see trends. yep--- its more trend related for that particular engine that on a unified grand scale of things. With enough data maybe some specific cooralation could be done--but yes i agree it would take a lot. One thing I believe that has already become apparent ---the viscosity showings are mostly so far not standing up as some may think? The flash points are lower than some may think also? driving enviroment, temps, adverage load on engine etc. I know you can make a case on the same affecting viscosity and it does but you can have wear metals without viscosity probs but not the otherway around? Once again George thank you for being a voice of reason. Ok Fellas!! Got a present today. Last edited by 9krpmrx8; 01-08-2010 at 10:43 PM. and this is a synthetic --right? not too bad for a new engine. next will be maybe in 2 weeks and i am waiting to see if my higher oil temps have improved the fuel percentage.